The Save Rye Common Action Group have launched their website to promote their opposition to the proposed Rye Common New Village development. They have also published a report from Berrys, a leading firm of quantity surveyors that sets out the main reasons for opposing development on this splendid example of the local countryside. Please do all you can to support them. Their website can be found here, and the Berrys report can be found here. More details about the proposals can be found in our earlier article. “The parish council are well aware of the consultation being undertaken for a large development at Rye Common, located within the parish of Odiham. More details about the proposals and how to respond to the consultation can be found here. 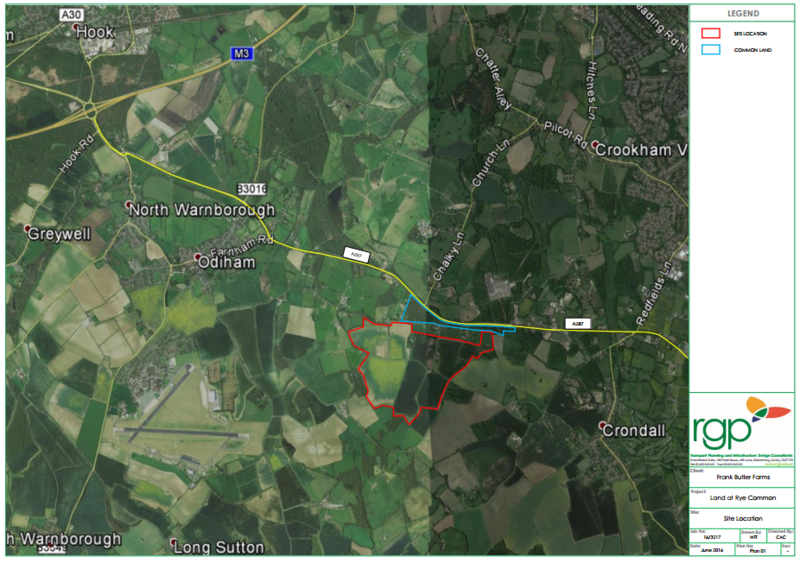 Bell Cornwell have launched a consultation on proposals to build a 1,600-1,900 new houses on around 140 hectares to form the so-called Rye Common New Village to the south of the A287 between Odiham and Crondall. We urge all We Heart Hart supporters to oppose the proposals by responding to the consultation that can be found here, on the grounds that it is not needed as there are plenty of brownfield sites available and Hart’s declared strategy is to prioritise brownfield development ahead of green field development. More details about the plans can be found in Bell Cornwell’s consultation microsite, leaflet and vision document. There are at most 2,350 more homes to be granted permission in the plan period (and according to a recent press release from Hart DC this may be further reduced by 1,500), and close to 4,000 dwellings that could be built on brownfield sites. Hart’s declared strategy is to prioritise brownfield development before green field development as can be seen on page 2 of the recent Refined Housing Options paper. It has been reported in Fleet News and Mail that Odiham Parish Council have approved their draft Neighbourhood Plan and submitted it Hart Council for checking before being sent to an examiner. Nine possible sites for housing have been included in the plan. Around 60 homes, or 30 homes plus a care home, could be built adjacent to Crownflelds in Odiham. 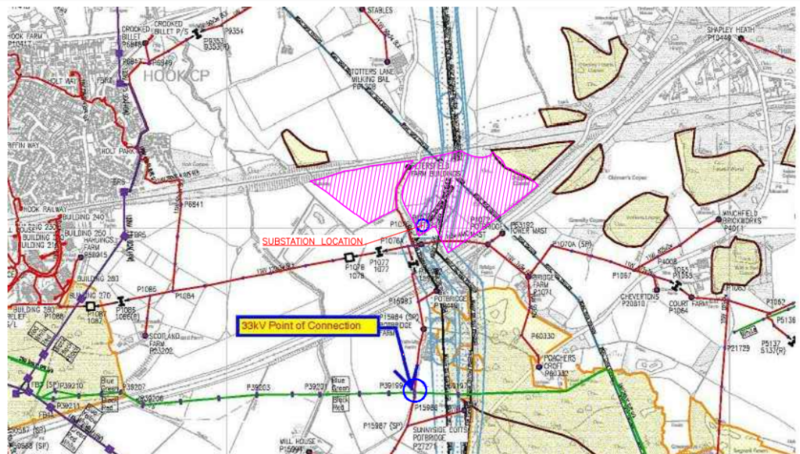 Other sites earmarked for development are at 4 Western Lane, Odiham (20 homes). Hook Road, North Warnborough (15), Albion Yard and Roughs Cottage, North Warnborough (both 12), Longwood, Odiham (10), Crumplins Yard, Odiham (eight), and land at The Swan Inn, North Warnborough (4). Land at Dunleys Hill in North Warnborough has also been earmarked for homes, subject to agreeing an acceptable minimum to allow for the remainder to be designated as a public open space or Local Green Space. This amounts to a total of around 141 dwellings, plus Dunleys Hill, which compares to 120 plus 30 at Dunleys Hill for sites identified in an earlier draft of the Neighbourhood plan set out in the recent consultation, plus an additional 264 dwellings on sites put forward for ranking by Hart Council in the New Homes Booklet. 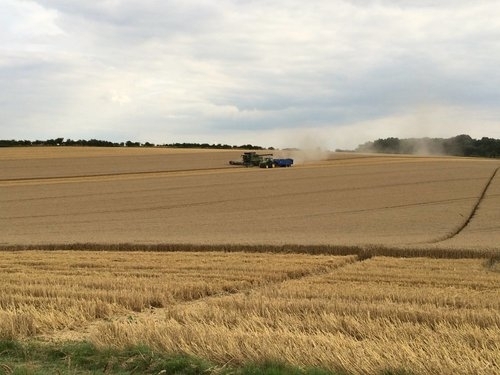 A number of the local Conservative Party candidates for the Hart District Council local election have been in touch and set out their current positions on the proposed Winchfield new town and the redevelopment of the 135-acre brownfield Hartland Park (aka Pyestock) site into 1,500 homes. 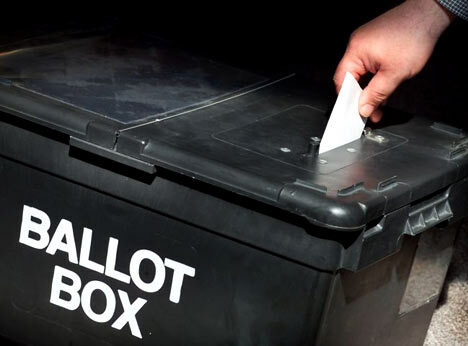 We contacted the local North East Conservative Party office and have had responses from some of the candidates and we contacted directly those candidates who are already sitting councillors. We have not yet had responses from all candidates. Do you support the new town proposed at Winchfield? Do you support the recently announced redevelopment of Pyestock for housing? First we have Jane Dickens, standing for the ward of Blackwater and Hawley who is keeping her views to herself on both issues. We find this to be a strange position, given that planning is one of the biggest issues that Hart councillors have to get to grips with, and of course the Local Plan has to be submitted to the Inspector within the next 12 months. It’s important when building new houses to consider all the facilities and amenities that those new families will need – for example, education, health, leisure and transport. A new town at Winchfield will put huge pressure on the existing services, and it’s not clear whether the facilities that will be built as part of a new town would actually meet the needs of the people moving in. I don’t think it is the right way forward. Building housing at Pyestock ticks many of the boxes. As a brownfield site, it makes a lot of sense to put that piece of land to good use, rather than leaving it derelict. A lot of work will need to be done to make the ground ready, but its location is much more suitable than Winchfield. I hope the history of the site can be reflected in the new road names. Chris Simmons, standing in Crookham West and Ewshot doesn’t support either the Winchfield new town proposal or the redevelopment of Pyestock. He didn’t say where he would want to see new housing to be built. 1) I support building on brownfield as a first preference. As regards any development after brownfield is used, or where it is not available, then greenfield may have to be used. I would prefer that Hart builds the minimum number of houses to meet government requirements, and I lobby government and our local MP so that the number Hart is required to build by central government will be as low as possible, yet still meets the needs of local residents. I am against accommodating any overspill from adjoining districts, as they should be required to meet all of their own housing needs. I feel Hampshire already has enough new housing planned in the South of the County, and near Basingstoke, so that high numbers of new homes on Hart can be avoided. I do not support urban extensions as a preference, as these contribute without sufficient infrastructure, therefore I do support in the longer term the selection of a new settlement at Winchfield but only if this is instead of urban extensions to Fleet, Church Crookham, Hook, Hartley Wintney, and Odiham. These urban extensions would still use greenfield, without the benefit that would be secured if a new settlement at Winchfield were part of the Local Plan for the longer term needs. In particular I am against developing Pale Lane andGrove Farm on the edges of Fleet, and yet more extensions to Church Crookham. Winchfield is potentially a suitable site for a well designed new settlement centred on the railway station, but would only be suitable if sufficient infrastructure (roads, surgery, schools. recreation, community facilities, retail, transport etc) were provided before build,and if strategic green gaps were retained between any new settlement and existing conurbations. It would need to have bus links as well to neighbouring areas. Ideally I would like to see no building on greenfield but that is unlikely to be a practical approach for the future. I would stress that any new brownfield housing, which is my personal preference, needs to be well designed, provide a mix of types of housing, and much the existing housing in terms of density and style, so as not to be overbearing, and not to overburden existing infrastructure. I do not support extensive office conversions, preferring well designed buildings and areas (i.e. demolish and rebuild, providing better design, layout, features, and infrastructure contribution). 2) Yes. I advocated this for some years and formally raised it at both Fleet Town Council and Hart District Council as something to be promoted actively, and I am really glad that it looks as though it will become a viable option, having been driven by the Conservative led team at HDC. Its good that the developers feel that it is viable, despite the decontamination costs of the land that will be required. Pyestock is brownfield, and we should always look to build on brownfield where this is possible, without losing existing major current employment sites. I think it far preferable to distribution and will cause less damage to the environment and surrounding towns. I feel it essential that the design is well thought through, so as to improve traffic in the neighbouring areas (i.e. possibly providing a through route from Crookham to M3 Jn4a avoiding Fleet town and not using Kennels Lane due to its dangerous bends), as well as having a long term regular bus link to Farnborough and Fleet station and town centres, Frimley Park Hospital, and having its own school, recreation and retail facilities. It should also provide a good mix of affordable & social housing, retirement homes, and homes for families, and should be as ‘green’ as possible. Of course Anne Crampton, standing in Hartley Wintney ward, has maintained her opposition to Winchfield new town throughout and does support the redevelopment of Hartland Park. I joined the council because of the 550 houses that were proposed at NE Hook and out of choice became part of the planning team that is processing that site and others around Hook. As you know none of which I welcomed and said so in front of all that attended the Basingstoke Hotel Hook residents meeting. I do not support urban extensions as they do not bring forward sufficient new infrastructure capacity but just overload current capacity. Nor do some Brownfield sites under permitted development! However I welcome the proposed development at Hartlands (sic) Park (Pyestock) with its 1000 plus housing which will reduce the housing numbers Hart has to deliver. Nevertheless this hasn’t changed my mind regarding the need for a large settlement site at Winchfield which I support as its deemed the only sustainable and developable site in the district to deliver sufficient housing numbers for the current ( impending ) plan and the future. As you would expect every District Councillor defends his Ward and therefore some of my Conservative colleagues particularly those serving Wards in and adjacent to Winchfield would naturally be against the proposed Winchfield development. I fully understand their position and I would do the same if it applied to Hook or Rotherwick. I’m unaware of a party line to vote one way or another on any future development and always intended to vote for and on behalf of Hook and Rotherwick residents within best practice in terms of planning policy. Hart Council has said Hartland Park has capacity for 1,500 homes, not 1,000. And of course it will not reduce the number of houses Hart has to deliver, but will make a significant contribution to meeting the alleged ‘need’. All of the sites proposed for the Winchfield new town are classified as “not currently developable” in the SHLAA, so it is misleading to suggest otherwise. No evidence has been presented to demonstrate that a new town at Winchfield is ‘sustainable’. Hook is adjacent to Winchfield, and indeed around 1,850 of the proposed 5,000 new houses in the Hartley Winchook new town are actually in Hook parish. One might hope that Hook councillors would acknowledge this fact and look more closely at our brownfield proposal that would result in fewer new houses in Hook than any of the other proposals. Now that Pyestock is on the table, this is now self-evident. As you know councillors have to be wary of being deemed to have pre-determined an issue. My answers to your questions are that on the basis of information currently before us I am not convinced that a new town is necessary at Winchfield. In fact it has been rendered even less necessary by the very welcome bringing forward of the 135 acre brownfield site at Pyestock, or Hartland as we should now call it. I have always thought it sensible to focus on brownfield sites first. We have still not heard the up to date views of Max Bobetsky, John Burton or Peter Hall. We have updated our table of all candidates and our summary page setting out the views of all candidates here. Local Elections 2016: Where do Hart candidates stand on new town and Pyestock redevelopment? Community Campaign Hart have launched their election page and have now answered our questions making clear they support the development of Pyestock, but want to ensure safeguards on school places and roads as well as ensuring the SSSI’s and SPA are protected. However, they still also support a new town in Winchfield. Their detailed answers and our responses can be found here. The North East Hampshire Conservatives have always been split on the issue, with many councillors voting in favour of the new town in November 2014, but notably all of the opposition to the new town came from local Conservatives. Of course, our local MP Ranil Jayawardena has opposed the new town idea too. We have had responses from many of the Tory candidates now and it is clear support for the Winchfield new town is weakening, with strong support for the proposed Pyestock development. The detailed answers we have received can be be found here. The local Greens have now said that all of their candidates oppose the Winchfield New Town and support the redevelopment of Pyestock (aka Hartland Park). They have also set out some interesting ideas on broader housing policy. The detailed answers we have received can be found here. North East Hampshire Labour have recently published an article in favour of the new town at Winchfield, stating it is the settled position of all of their candidates. They have also published an article supporting redeveloping Pyestock for housing, but make clear they also support a new town at Winchfield. Our response to that can be found here. All of the sitting Liberal Democrats on Hart Council all voted in favour of the new town in November 2014. The Lib Dem County Councillor (David Simpson) opposes the new town, and some local candidates stood on a platform opposing the new town in May 2015. The local Lib Dems have published a newsletter in Hartley Wintney and Eversley opposing the new town idea. They later published a leaflet supporting the redevelopment of Pyestock. We do not yet know if this represents the views of Lib Dems across the district. The posts related to their leaflets are here and here. We only know the position of the local UKIP candidate for Hook. He opposes the Winchfield new town and supports a brownfield first policy, but has made no definitive statement about Pyestock. However, UKIP have made a statement on their website, supporting a brownfield first strategy, which is recorded in this post. We have contacted all of the local parties and asked them to clarify their views on the new town and Pyestock. We will update the table below when we receive answers from the parties or individual candidates. If any of the candidates want to get in touch to clarify their current position, we will happily make any corrections requested. Our contact email address can be found here. Blackwater and Hawley BLEWETT, Brian Frederick Liberal Democrat Voted in favour Nov 2014 ? Fleet Central BOBETSKY, Max The Conservative Party Candidate Opposed when stood for General Election 2015 ? Fleet Central HOPE, Howling Laud The Official Monster Raving Loony Party ? ? Fleet East WALTON, Neil Christopher Liberal Democrat ? ? Fleet West EINCHCOMB, Paul Stephen Walter Liberal Democrat ? ? Hook IVE, Colin Liberal Democrat Voted in favour Nov 2014. No specific comment in this election. ? Odiham GORDON, Rosalyn Jane Liberal Democrat ? ? Yateley East BURTON, John Peter Simon The Conservative Party Candidate ? ? Yateley East COCKARILL, Graham Liberal Democrat Voted in favour Nov 2014 ? Yateley West CRISP, Gerry Liberal Democrat Voted in favour Nov 2014 ? Yateley West HALL, Peter The Conservative Party Candidate ? ? Further to our post of yesterday, that showed the impact by parish of following a dispersal strategy, we have now created graphs to show the impact by parish of urban extensions and a new town. In each case, it shows that the urban areas of the district are not taking their fair share of housing. This demonstrates to us the need to step up efforts to follow a brownfield strategy and re-find the 1,400 units on brownfield sites that Hart lost after saying that 1,800 units on brownfield land could be readily quantified back in September 2015. Of course, only 2,000 of the full 5,000 will be delivered before 2032. We have distributed these across Winchfield (in others) and Hook parish in the same ratio of the overall delivery shown in the SHLAA. However, the secret plan from the Winchfield Consortium showed the Murrell Green sites would be developed first, so this may understate the impact on Hook. The urban extensions are at Pale Lane which is split across Elvetham Heath and Hartley Wintney parishes, west of Hook which is in Hook parish and west of Fleet (in Crookham Village Parish]. 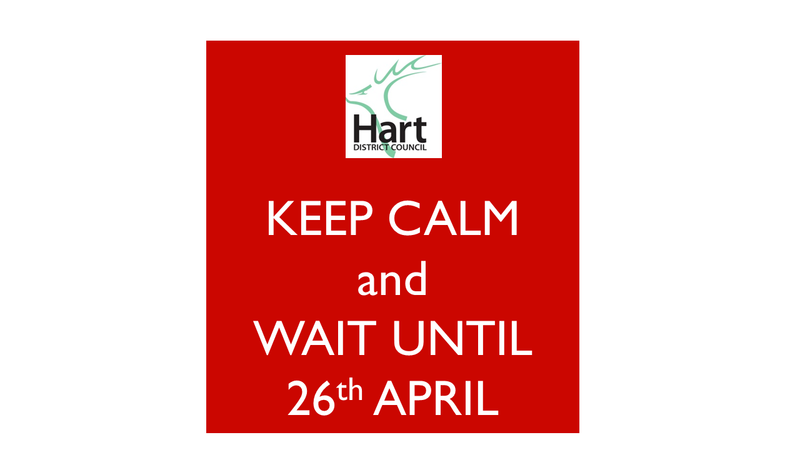 If you would like to ask Hart to abandon the new town and urban extension ideas and create a brownfield solution to our housing needs, we urge you to respond to the Hart District Council consultation about the Local Plan and ask them to think again. We have created a dedicated consultation page and updated our two guides to responding to the consultation that are available on the downloads below. The comments are designed to be cut and pasted into the boxes provided. It will be very powerful if you could edit the comments into your own words. Please do find time to respond to the consultation and play your part in saving our countryside. 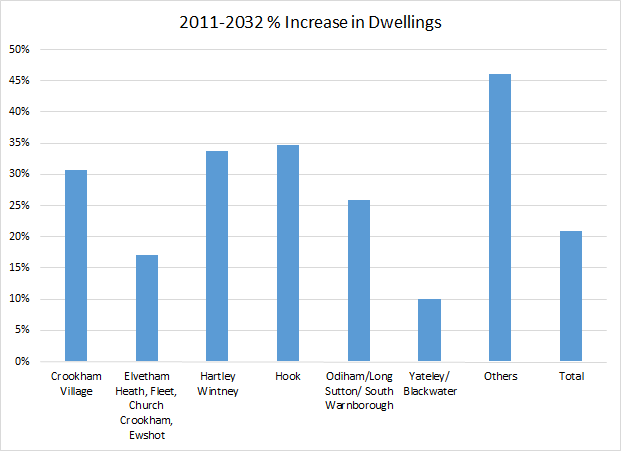 Proposed percentage increase in dwellings by parish in Hart District. Hart Council has published a lot of data related to the new consultation. We have taken a look at it, come to the conclusion that the combination of the houses built or permitted since 2011, plus the proposals for dispersal show that our urban areas are not taking their fair share of housing. We think that Hart District should be trying harder to find brownfield sites in Fleet, Yateley and Blackwater to redress the balance and save our countryside (see slider of sites below). 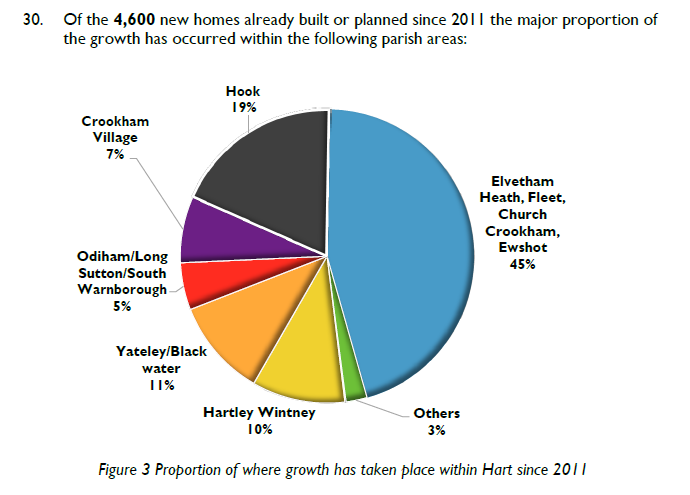 It did look odd to us that the parishes of Elvetham Heath, Fleet, Church Crookham and Ewshot should be grouped together like they were to give the impression that these parishes had already taken a lot of housing. Of course if you combine a number of parishes together, then it is obvious that their combined contribution is going to be larger than the individual parishes to which they are compared. 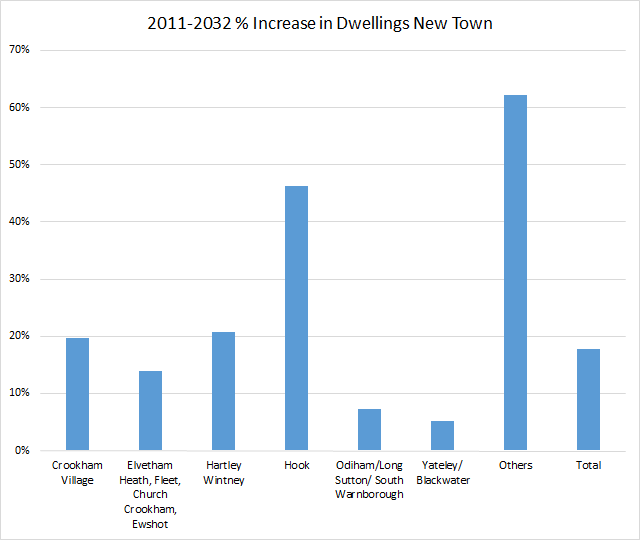 This shows that the urban areas that include Fleet, Yateley and Blackwater will take the lowest %-age increase in housing. Whereas, places like Hook, Hartley Wintney and the other rural parishes are going to take massive %-age increases in housing. Of course, a new town would disproportionately impact Winchfield, but would also lead to 1,800 further houses in Hook and effectively join those parishes to Hartley Wintney, into a giant Hartley WInchook conurbation. 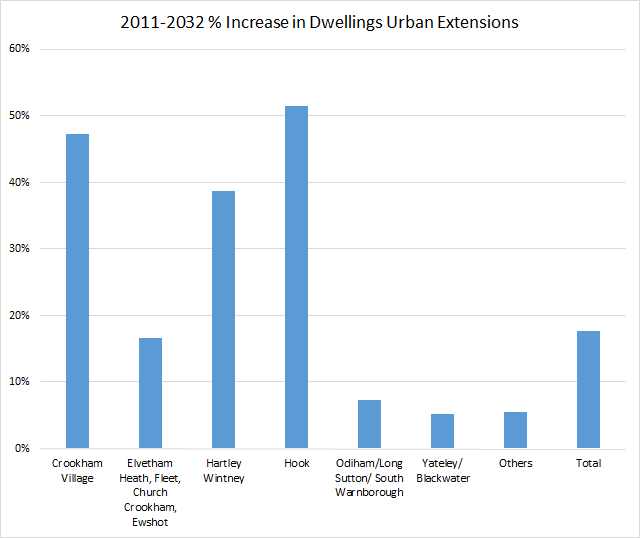 Even the proposed urban extensions will further increase the pressure on Hartley Wintney and Hook. 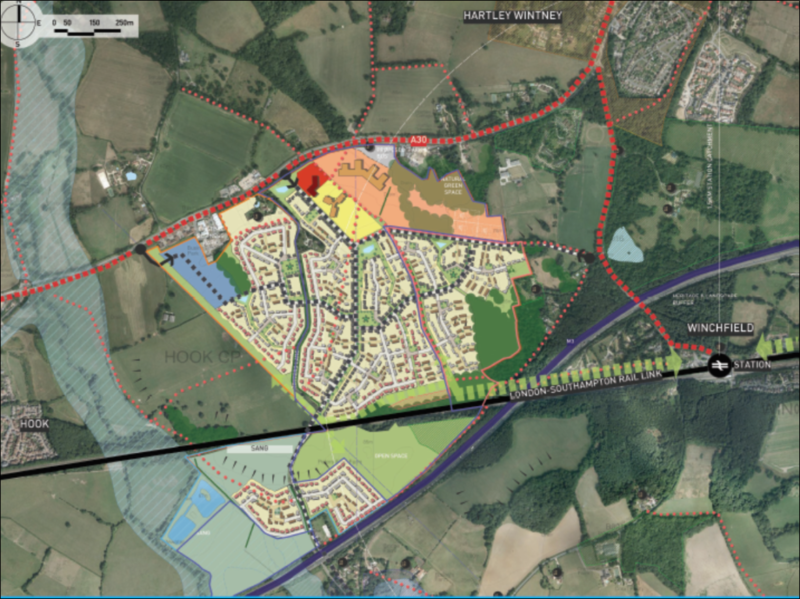 One of the proposed extensions, the so-called Pale Lane extension (SHL 52) is largely in Hartley Wintney Parish, and another of the extensions is to the west of Hook (SHL 173).